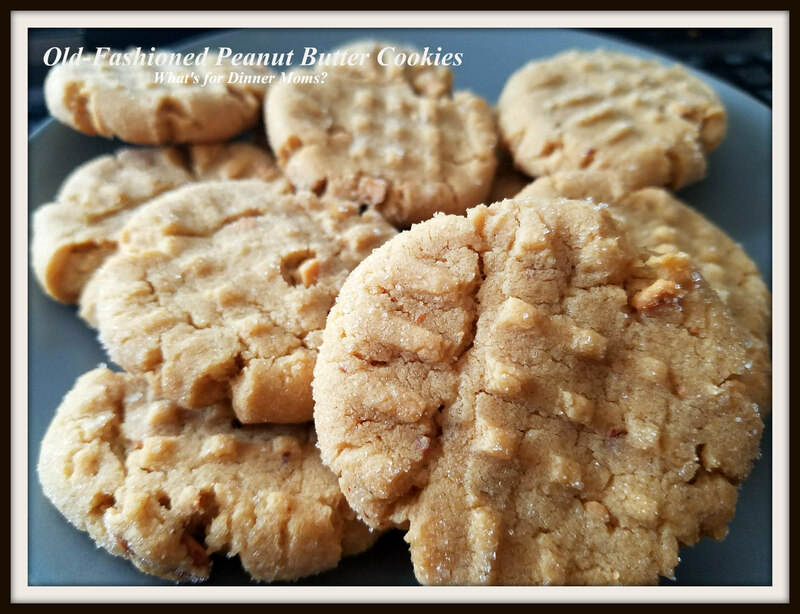 Old-Fashioned Peanut Butter Cookies – What's for Dinner Moms? Sometimes only cookies will help make the day better or are the perfect way to celebrate. My partner had someone in her department take a new job so they were celebrating his last day yesterday. Over the weekend almost 14 dozen cookies were made for her office. My kitchen was like a little bakery all weekend. Since she is the baker she has decided that she wants to start recreating all those cookies that bring back good memories for everyone. The type of cookie will depend on your age, where you lived, your family heritage but they are the cookies that make you think of warm kitchens, lots of hugs, and ice-cold milk. What is the cookie that does this for you? This was by far the most popular cookie on the trays yesterday. I think most people only make Peanut Butter Cookies at Christmas time now and in the form of Blossoms with a Hershey Kiss in the center. Everyone kept saying, “Ooo, peanut butter.” So, this was the clear winner of the day. With some of the leftovers at home we made ice cream sandwiches with Chocolate Brownie Ice Cream. This is a fun, simple way to have everyone make their own dessert. Mix and match cookies and ice cream to your taste! Mix flour, baking soda, baking powder, and salt in a bowl until well blended. Beat flour in a second bowl until light and fluffy. Add sugars and continue beating until it returns to light and fluffy. Add peanut butter and continue beating. Then beat in eggs and vanilla. Gently stir dry ingredients into peanut butter mixture with the crushed peanuts. Stir until just fully incorporated. Roll cookie dough into 1 1/2″ ball sized pieces. Dip in granulated sugar to coat. Place 1″ apart on baking sheets. Gently press a fork into the dough pieces to make the criss-cross shapes and press down the cookies. Bake for 10-12 minutes. Cookies will not look completely done. Be careful these cookies over bake quickly and become very hard. Remove pan from oven and allow to rest a couple of minutes before moving the to a wire rack to cool completely. Peanut butter cookies do it for me! I remember the rolls of cookie dough and that burning peanut butter cookie smell! Awe! What a wonderful memory! THANK YOU for this recipe. Peanut butter cookies are my husband’s favorite. Hope you like them if you try them! My favorite, These look delicious! I’m not a huge fan of peanut butter unless there’s sugar involved, but BP cookies just aren’t the same without the fork marks. This is why my mom’s always look like. I wonder if that’s considered old fashioned these days? I found out, yes. They are more the slice and bake type now with no fork marks and a sprinkling of sugar. Oh ! It takes me in past when my mom baked cookies for me. I love those little moments when something triggers a happy memory! Thank you! I love peanut butter cookies! Just the right amount of sweetness! Thanks for posting.